The latest production news, direct from Paine Field. 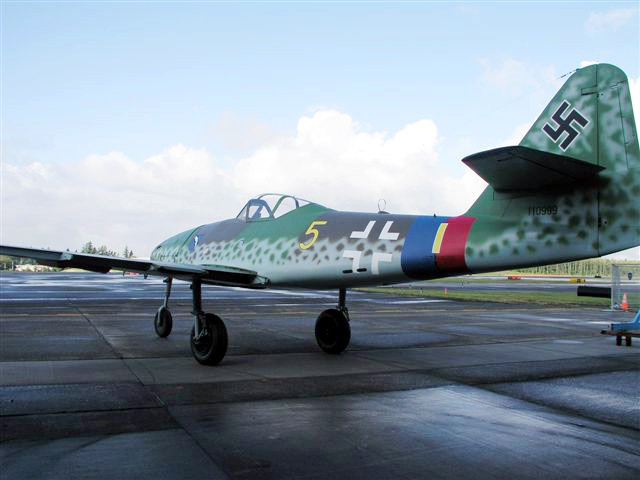 Gelbe 5 is currently for sale and represents an extremely rare opportunity to obtain a brand-new static Me 262. Messerschmitt Me 262 Gelbe 5 is now finished! 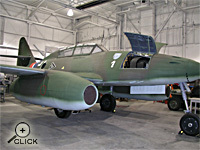 This museum quality static reproduction Me 262 is shown rolled out in front of the Legend Flyers hanger in the photos above. 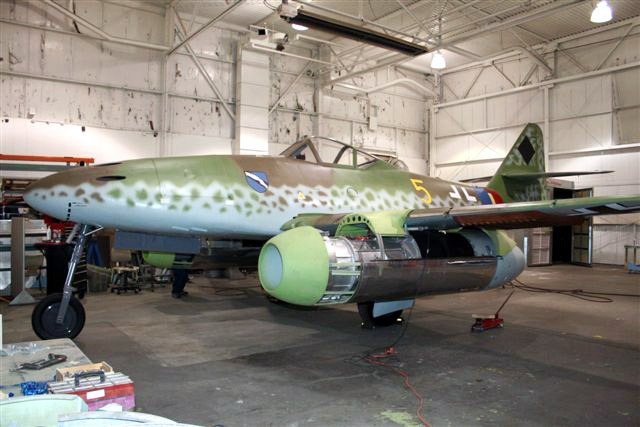 Messerschmitt Me 262 Gelbe 5 is nearing completion. 24 R4M rockets have been installed, making this the only example in the world to have this type of weapons option. 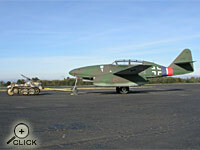 The Me 262 is available for sale and would make an excellent center piece for any museum or private collection. The price has been reduced from $1.1M to $650K USD. 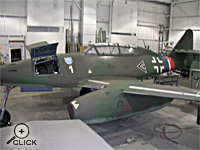 In addition to "Gelbe 5", the third and final flying Me 262 example is nearing completion and is also available for sale. 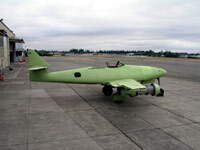 The flying aircraft is a two-seat example which can be converted to a single seat for movies, airshows, etc. and is priced at $2.5M USD. Interesting trades and possible financing considered. 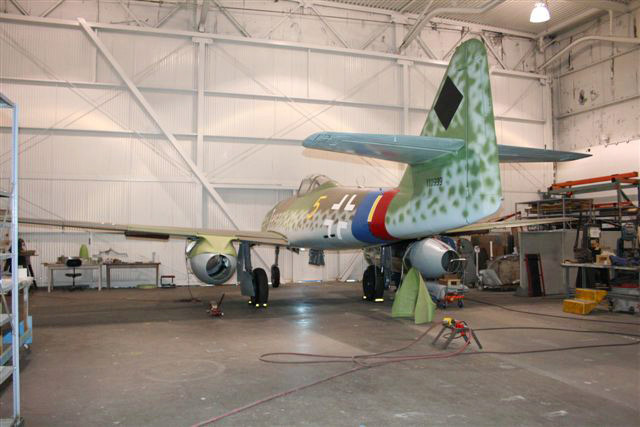 After taking a break from the Me 262 Production to complete a private restoration project we are now resuming our program. 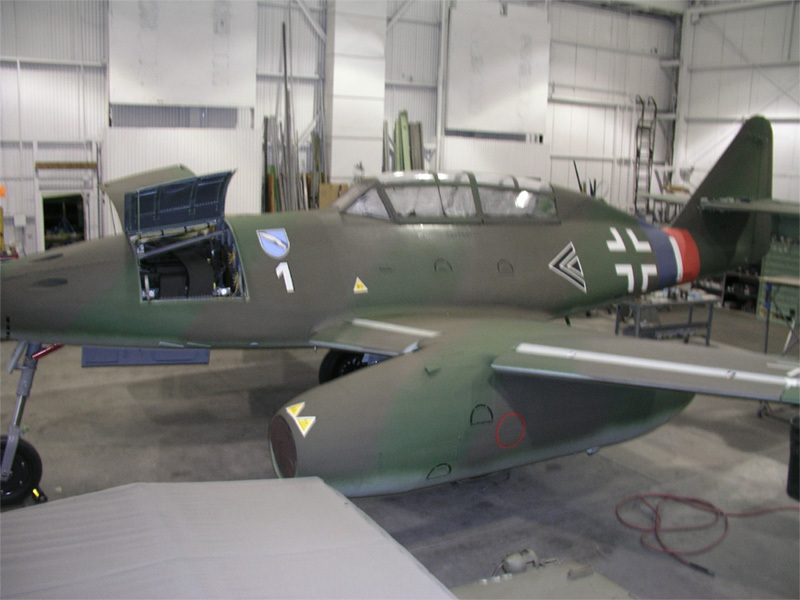 We are currently working on a single seat Me 262 Static display aircraft. Current plans are to feature the 24 R4M rockets (12 mounted under each wing). IN MEMORIAM It is with deepest regrets that we announce the loss of Mike Harris following a battle with bone cancer. 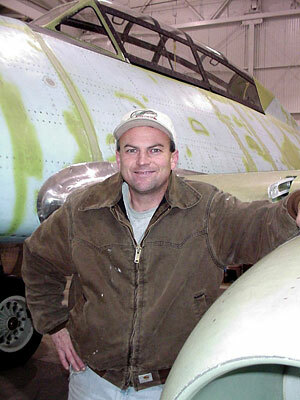 Mike had been a valued member of the Me 262 Project crew since 2001 and his talents and great sense of humor will be missed. "White 3" emerges from the Hangar! 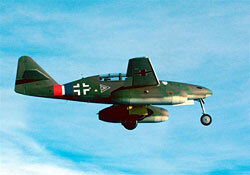 Legend Flyers pulled out Messerschmitt 262 White 3 for some sunbathing in the spring weather. 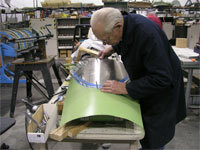 The canopy for the single seat version is nearing completion and engines are nearing installation. 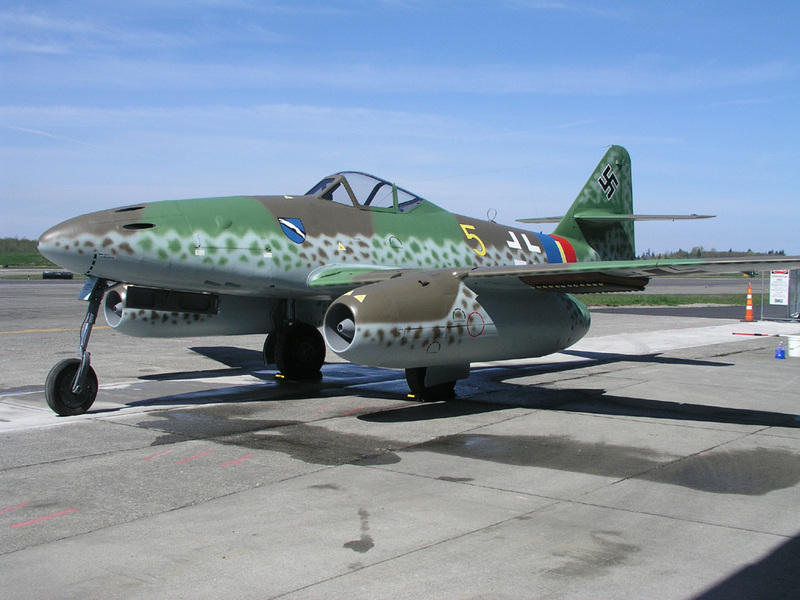 It is possible that the Me 262 could be flying this summer, and MAYBE, just maybe even be available for the Gathering of Mustangs in Columbus, Ohio in September. 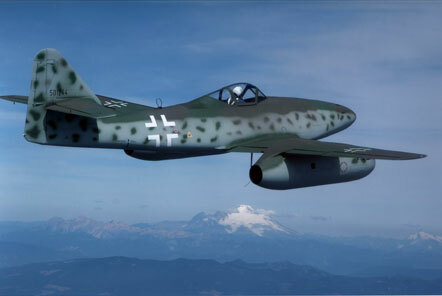 You can be one of the first to ride in the Me 262 with the Collings Foundation. 1.Cockpit instrumentation is installed and being tested. 2. Slats are being constructed for left and right hand wings. 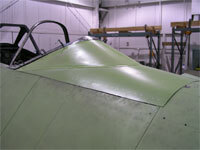 3.Canopy construction is being finalized with completion of the two seater canopy expected next month. 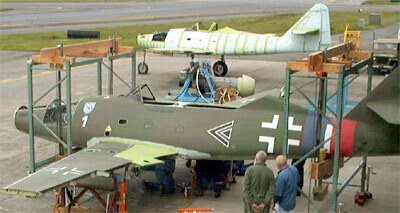 ME 262 #3 PROGRESS. A significant milestone was recently achieved on Airplane #3. 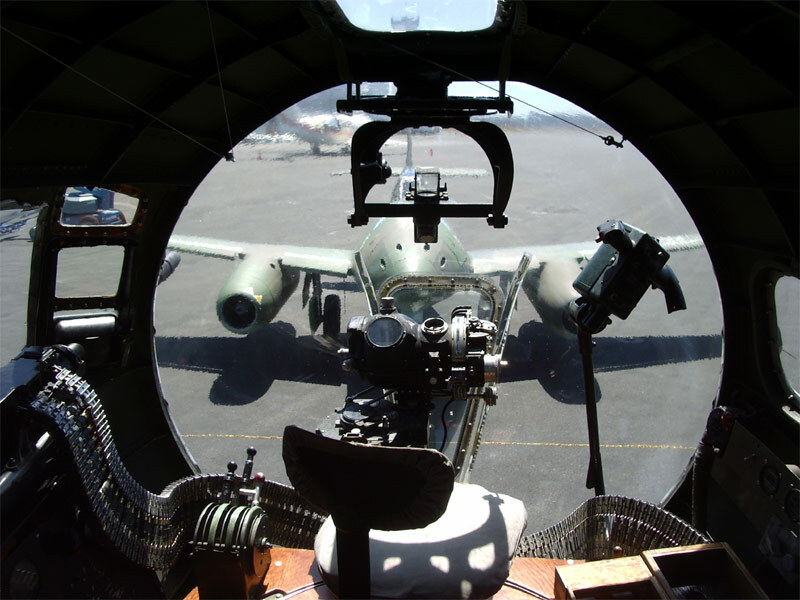 The airplane was rolled out and an instrumentation swing to calibrate the front and back seat instruments was performed. All calibrations successfully completed in one shift. MAGAZINE COVERAGE! 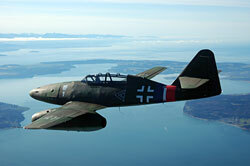 Look for an article on the Legend Flyers Me 262 Project in the November issue of Smithsonian Air & Space Magazine! 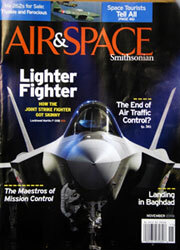 There is a small photo of "White 1" on the cover and a well done article featuring the project. Here is a link to the full article. SPECIAL GUESTS VISIT! 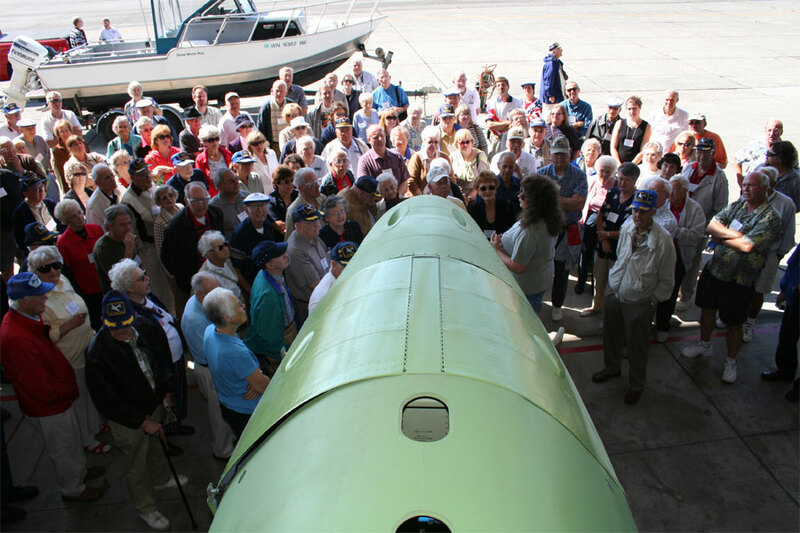 The 379th Bomb Group held their reunion in the Seattle area and after a tour of the Boeing factory spent the afternoon at our facility. 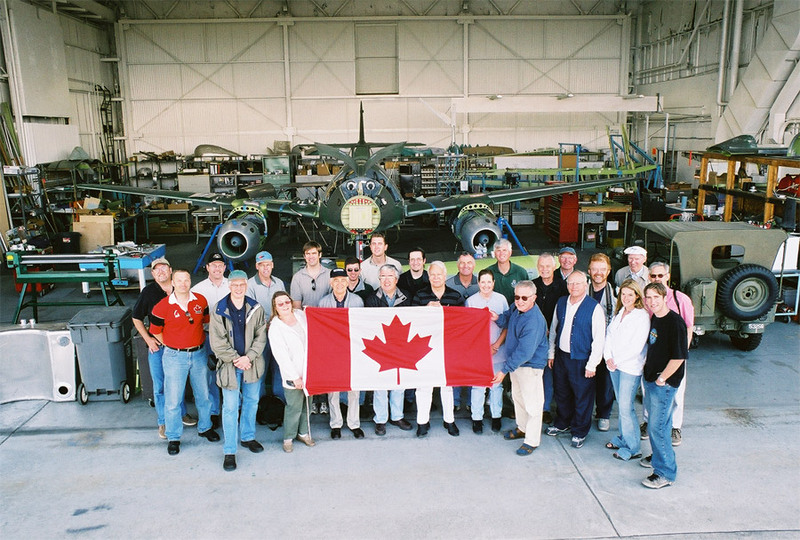 After a brief talk telling them about the current reproduction project, the guests who had encountered the original Me262 in a combat situation shared some of their experiences. One of the visitors, Henry M. Pearce, Jr. was a 1st Lieutenant on the B-17 "Pipe Dream", A/P # 43-38874. 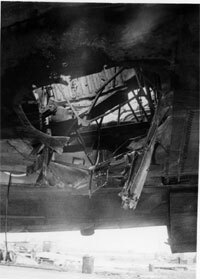 While on their 322nd mission they came under fire from a Me262 and returned to Oranienburg with a 30 mm hole in the wing. 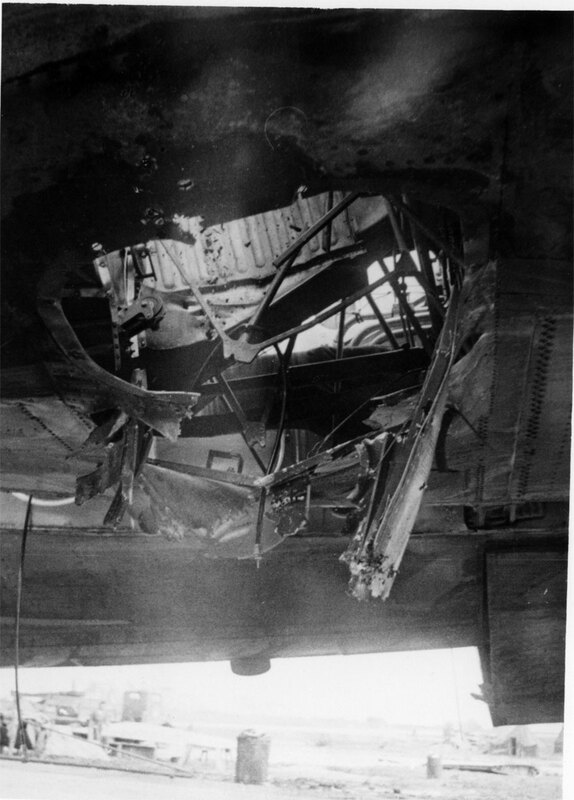 Henry provided us with a picture, taken April 10, 1945, of the 30mm hole in the wing of the B-17 on which he was the navigator. ENGINE INSTALLATION ON AIRCRAFT #3. We have just attached the engine cans and are beginning the wiring installations. Stay tuned for more as the final assembly continues. 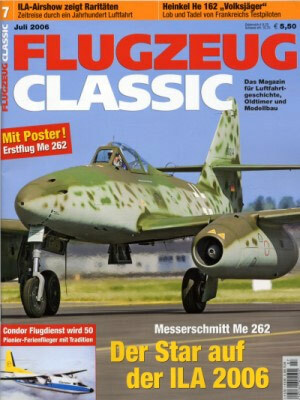 MAGAZINE COVER - FLUGZEUG CLASSIC! We just made a magazine cover in Germany. Flugzeug Classic (July issue) features Tango-Tango on the cover and says that our airplane was star of the ILA 2006 show! "WHITE 1" DELIVERED! 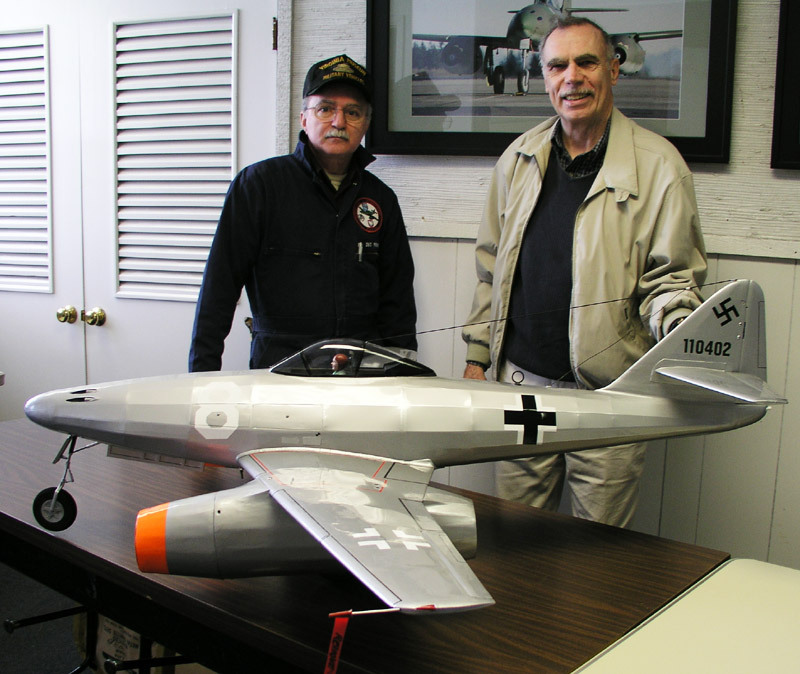 Judge Lou Werner, the owner of White 1, took delivery of his aircraft this weekend. Test pilot Wolf Czaia gave Judge Werner a ride in the back seat on Saturday afternoon. Following the 35-minute ride, Judge Werner commented that he thought it was great. White 1 departed at about 2 p.m., Sunday afternoon, 6/11/06, with Wolf Czaia at the controls. 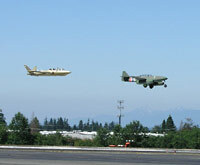 White 1 was accompanied by a Cessna Citation piloted by Lynn Harpham with Judge Lou Werner and Mike Anderson, the project's crew chief, on board. 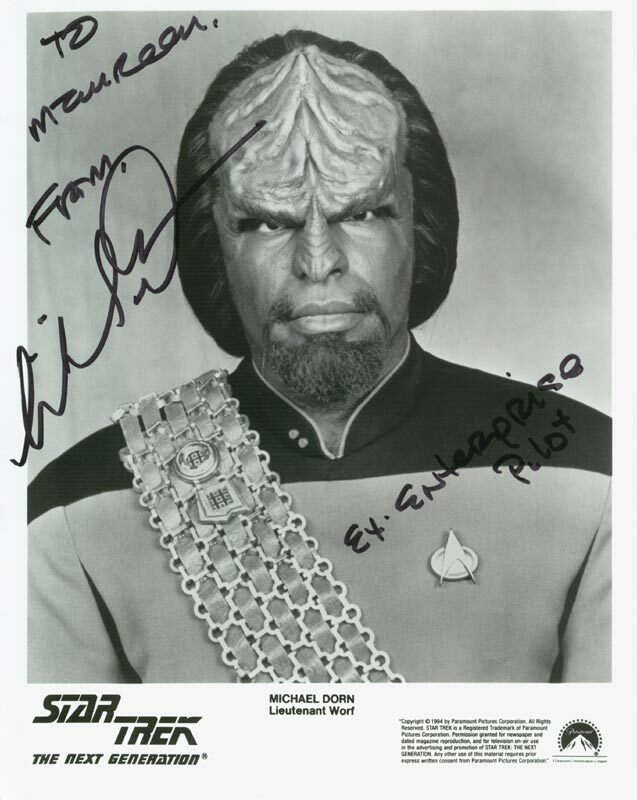 Michael Dorn (Lt. Worf on Star Trek NG) was in town and stopped by the project. 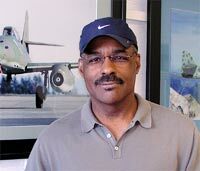 Besides being a qualified starship pilot, Michael also owned an F-86 Sabre for many years, so he looked right at home in the cockpit of "White 1". Another milestone achieved! Wing & body join has been completed and Airplane #3 is now resting on its gear. approx. 14 minutes with the pilot Horst Philipp at the controls. The first public flight is scheduled for May at the ILA /International Aviation Exhibition in Berlin. Airplane # 3 has entered final assembly with the joining of the wing and fuselage! The join went smoothly and resulted in a very snug fit requiring no additional shimming or adjusting. TANGO-TANGO ARRIVES! These photos of Tango-Tango being unloaded in Luxembourg were taken by Patrick Jeanne (for Cargolux) on the evening of Tuesday, January 10th. 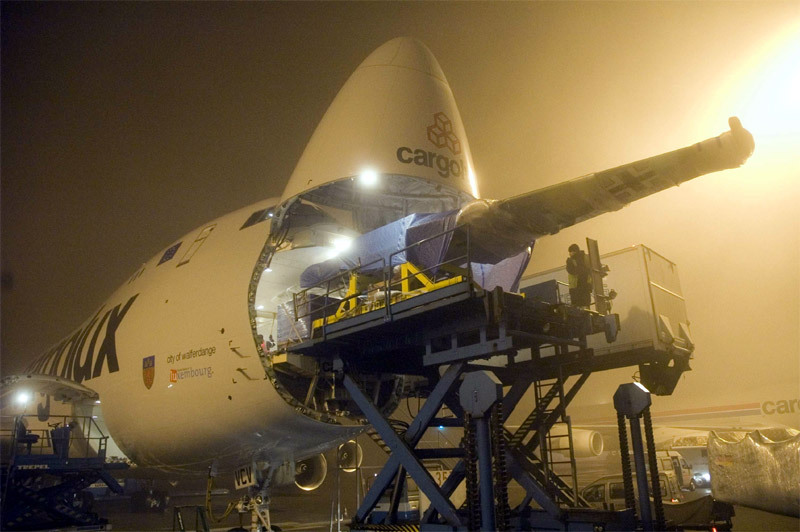 The Cargolux 747 was loaded in Seattle on Monday night and arrived Tuesday. We have all the paperwork down at Cargolux for immediate shipment of Tango-Tango as soon as they have space available on one of their flights out of Sea Tac. Our initial estimates for delivery in late November proved slightly optimistic because of unepxected delays in the issuance of a U.S. State Department export license. At 9:25 a.m., Tango-Tango was loaded onto three 18 wheelers for transport to the Cargolux terminal at Sea Tac Airport in Seattle , Washington. Next stop Luxembourg! 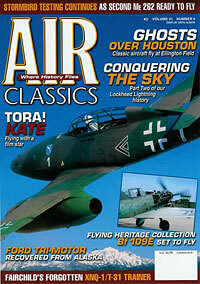 Aeroplane from the U.K. (December Issue in English) & Klassiker (December Issue 6/05 in German). 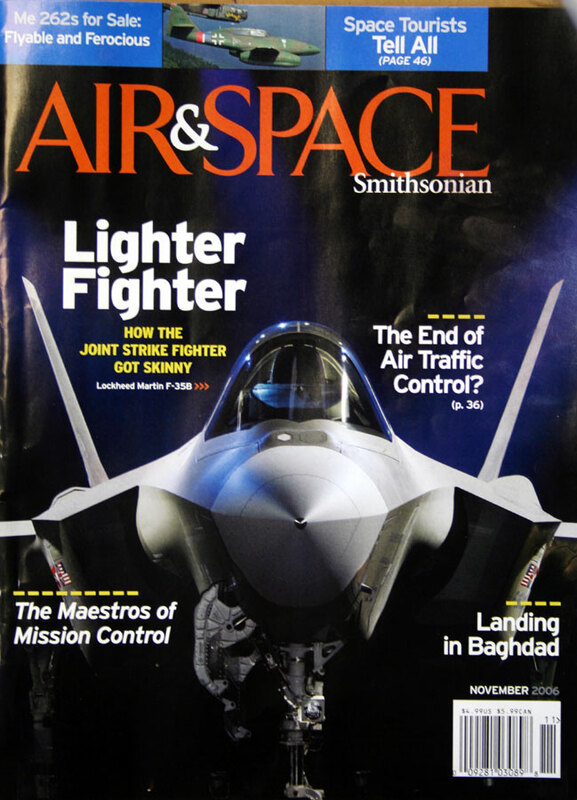 Both of these issues featuring Tango-Tango with air-to-air photo s from Jim Larsen. Cargolux also has an internal magazine called Pulse, and they have put one article already about the delivery of Tango-Tango and are preparing another for release next month. Cargolux PR is treating this as a significant event between them and Messerschmitt Foundation. TANGO-TANGO is disassembled and packaged for shipment to Munich. The airplane will be delivered to Luxembourg as reported earlier and our "packages" will then be trans-shipped to Munich by truck. 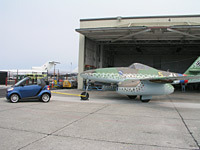 Re-assembly will take place at Willie Messerschmitt Hall in Munich, with plans for making both flying and static appearances at 2006 Berlin Air show. 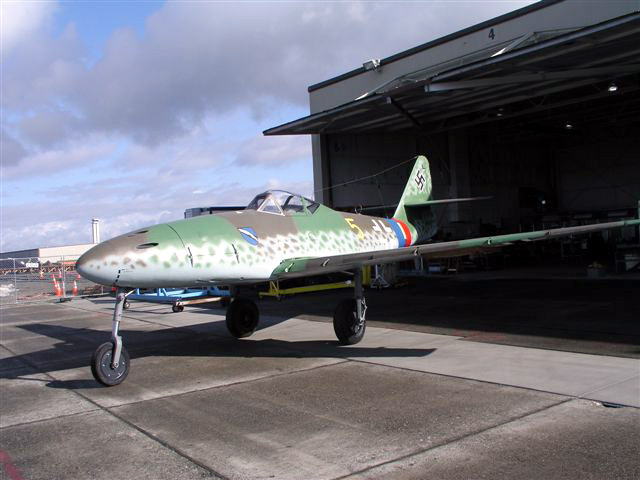 We are meeting early next month with our Messerschmitt customers to finalize all of the above activities and assist them in their preparation of data for obtaining their in-country air worthiness certificate from the LBA. White 1 will be flying the last couple of test flight hours within the next month (weather permitting). 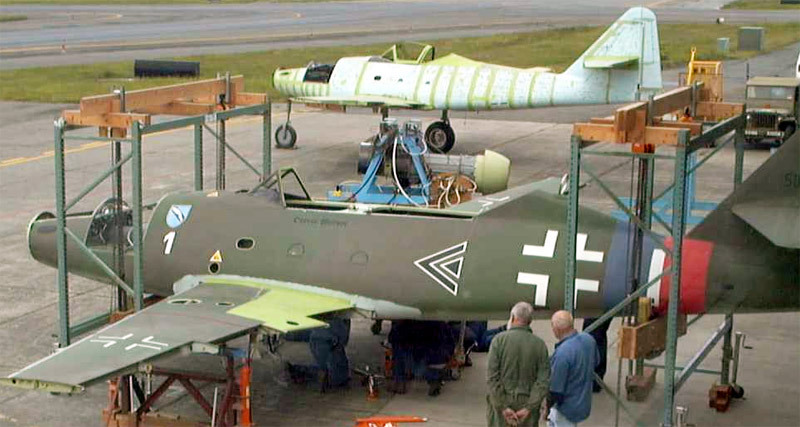 Then, following touch up paint and completion of manuals, this airplane will be ready for delivery. Tango-Tango completed 10 hours of test flying in a mere two weeks (8/15 - 8/26). The airplane is now disassembled and ready for delivery. We are actually awaiting the completion of a new Cargolux 747 freighter by Boeing, as this jet will serve as the transport for Tango-Tango's delivery trip to Germany. 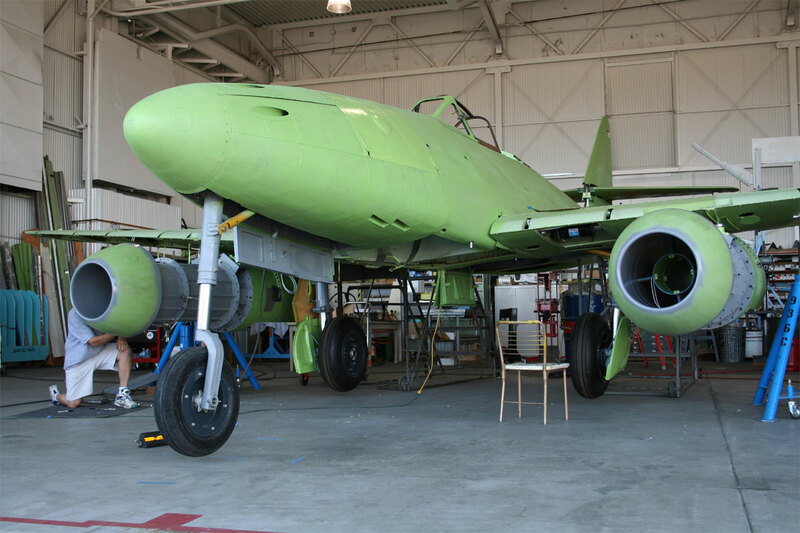 Work continues on the third jet, which is currently awaiting installation of the nose to the main fuselage. We must then install the cockpit tub and attach the wings. 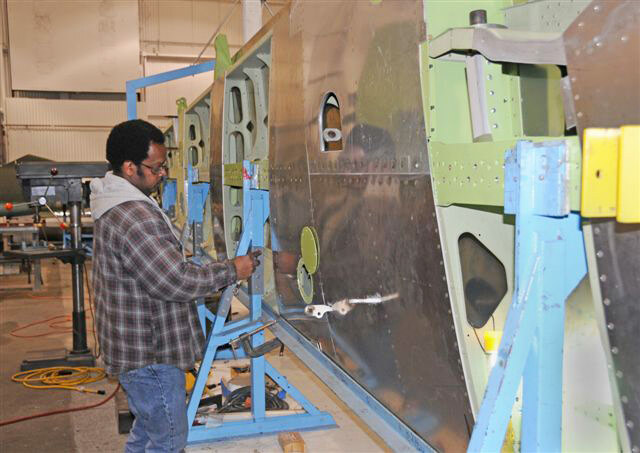 Before any of this can happen, we need to deliver one or both of the finished airplanes, as once the wings come out of the jig for completion of lower skins (and then being joined to the fuselage), they will take up most of the room in the hangar. TEST FLIGHTS COMPLETED We've been quietly flying the test program hours off of the Tango-Tango airplane, and are pleased to report that as of today, the last hour of FAA required flight test time was logged, paving the way for Tango-Tango for move ahead to the delivery phase. We are declaring our flight tests complete! 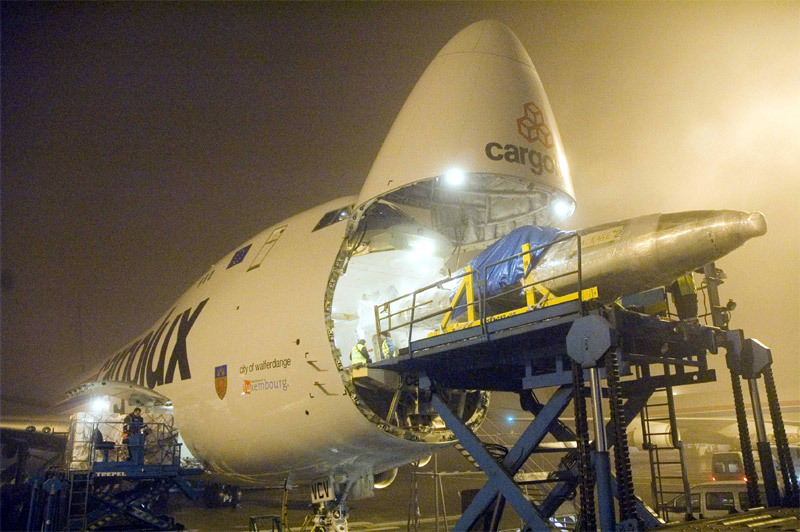 The airplane will now be disassembled and prepared for shipment on the Delivery Flight of a Cargolux 747 in October 2005. 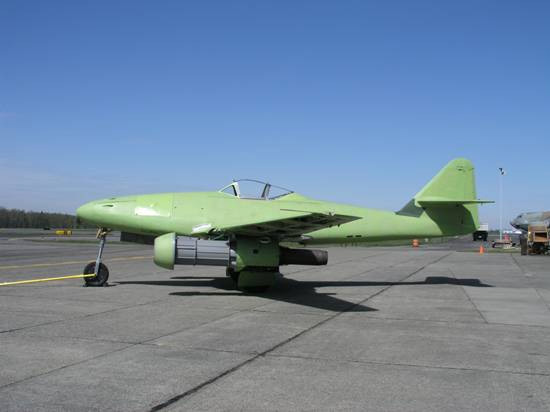 The next flight of Tango-Tango will be in Munich, Germany piloted by Horst Philippe of the Messerschmitt Foundation flying team. More news to follow as these events unfold. WHEELS UP! Wolfgang took Tango-Tango up for a very significant wheels-up flight today, accomplishing successful gear deployment and retraction tasks with a Fuga Chase Plane flying overwatch. THE LEGEND FLIES AGAIN, PART II We are extremely pleased to report that our second jet, Tango-Tango completed her first flight today, spending an uneventful 45 minutes aloft with a Fuga jet flying chase. 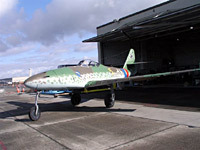 This event marks the first time a single-seat Messerschmitt 262 has flown anywhere in the world in more than 50 years!. The aircraft will now be put through a similar flight test program to the one recently completed by the White 1 machine. When compete, the final destination for Tango-Tango will be the Messerschmitt Foundation facility at Manching, just ouside of Munich, Germany. CERTIFICATION APPROVED Now that Tango-Tango has been granted an airworthiness certificate for the United States, we have passed this information to the Messerschmitt Foundation in Germany, where they are working with the LBA to obtain certifcation in-country. 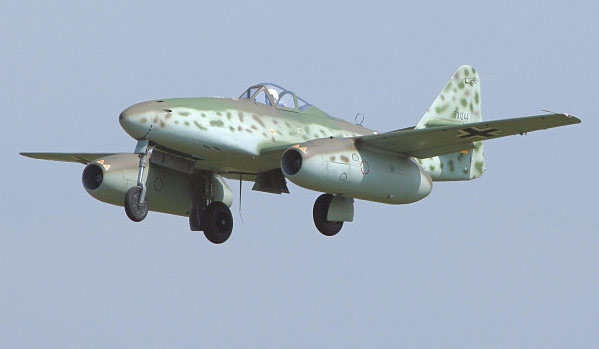 Since the LBA does not have an experimental category, the authorities are still working out a plan to grant formal flight approval for the Messerschmitt's long-awaited return to German skies. Flight testing of Tango-Tango is scheduled to begin later this month, again with Wolfgang Czaia at the controls. We are now finishing up with the resolution of minor deficiencies noted during earlier taxi and engine tests. MORE MESSERSCHMITTS? 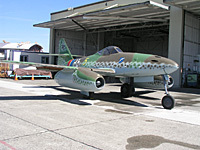 Many aviation enthusiasts have recently taken notice of announcements on Aero-News and elsewhere regarding a proposed follow-on restoration project for the team here at Everett. We are currently in the process of preparing an official statement for release later in the summer. 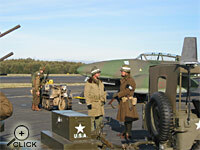 In the meantime, you may wish to monitor the Warbird Recovery web site for further information. A MILESTONE FOR TANGO-TANGO We are pleased to announce that the FAA has just awarded Tango-Tango an airworthiness certificate with "no findings" for the United States. In other words, the aircraft passed this critical test with flying colors! Tango-Tango already has completed a couple of taxi tests so our next priority is to start planning for the first flight of this aircraft. We currently expect this to take place in early to mid-June. Stay tuned! 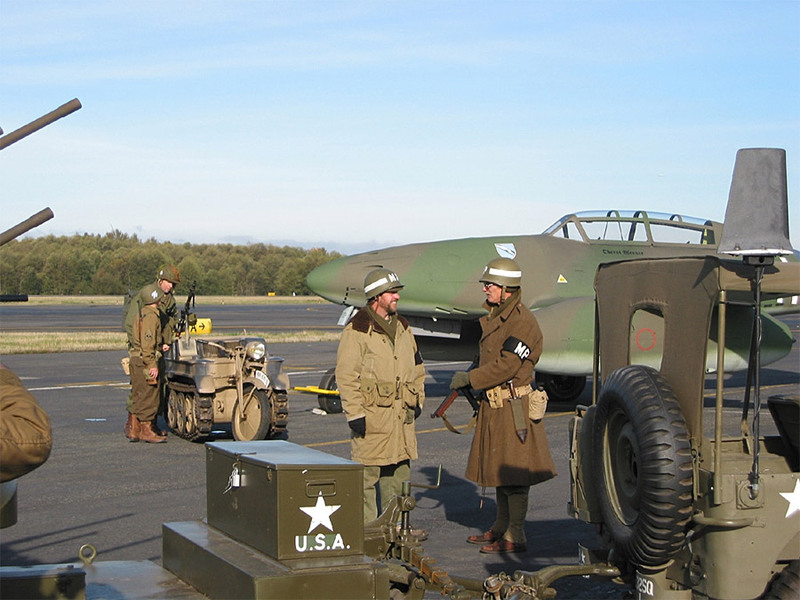 GENERAL AVIATION APPRECIATION DAY Last week, we marked this event here on the airfield with special public appearances by not one, but two, of our new Me 262 jets. Rather predictably, the machines generated considerable interest and excitement. Some images from the day have just been added to Tango-Tango's new PHOTO GALLERY page. 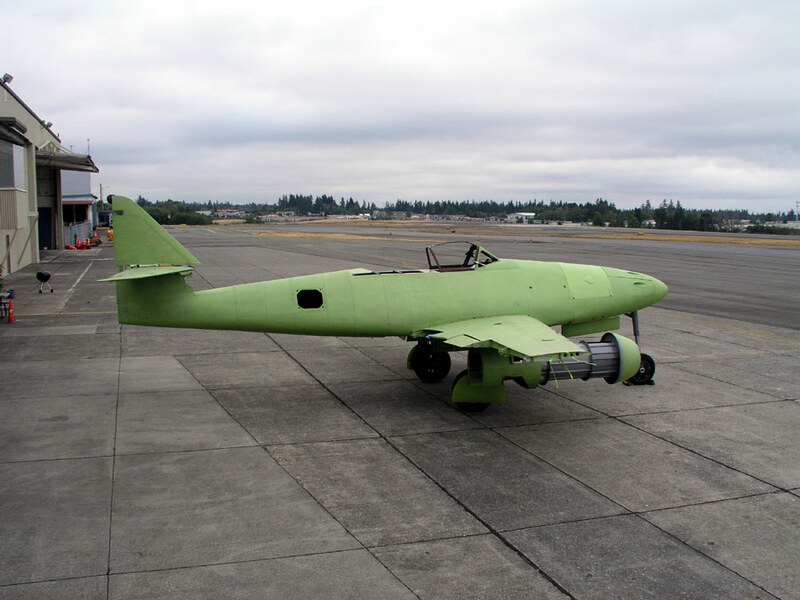 TANGO-TANGO, our first A-1c model (single-seater) rolled out of the paint shop today wearing a correct late-war RLM scheme, as specified by the Messerschmitt Foundation. We think the machine looks absolutely spectacular, but don't take our word for it: see it for yourself on the our latest PHOTO GALLERY page. 1. White 1 completed (2) demonstration flights on March 29th. 3. Tango-Tango is now in the paint hangar for her final customer-approved exterior paint scheme. More information on this development is yet to come. 4. Tango-Tango flight test pre-planning is now underway with the FAA. COVER STORY White 1 and test pilot Wolf Czaia are gracing the cover of the May 2005 issue of the U.K.-based Aeroplane Monthly magazine. Check your favorite newsstand to review a copy today! 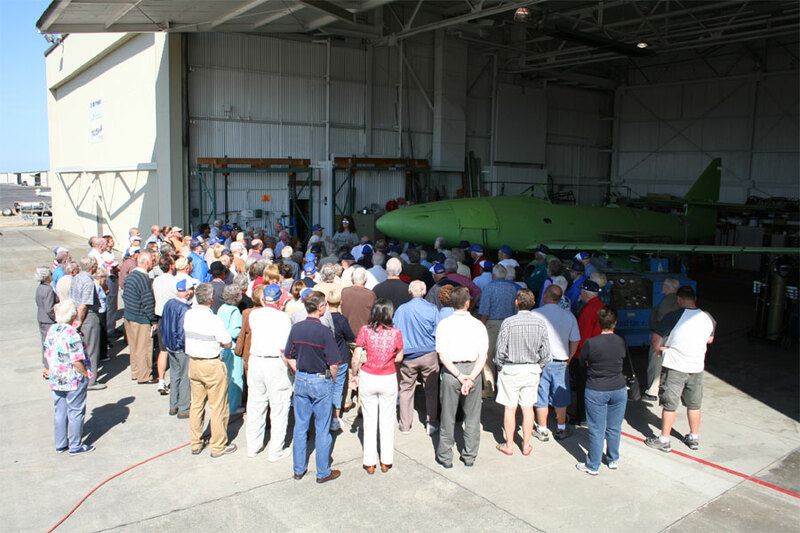 EAA CONFERENCE UPDATE The National Warbird Operator Conference was recently held in Seattle, giving us a great opportunity to bring the community up-to-date on our progress. A break in the weather even afforded our test pilot the opportunity to put on a short demonstration flight for those in attendance. View the EAA Warbirds article here. STILL MORE GOOD NEWS! Yesterday turned out to be a day of significant progress for us. Following the successful "wheels up" outing, White 1 was given a thorough once-over and sent back out onto the runway for test flight number nine! Before this rather monumental day was through, White 1 had logged yet another 60 minutes aloft, reaching a speed of 360 knots in the bright Seattle sunshine! MORE GOOD NEWS! Test flight number eight took place today just before 1400 hours (local time). 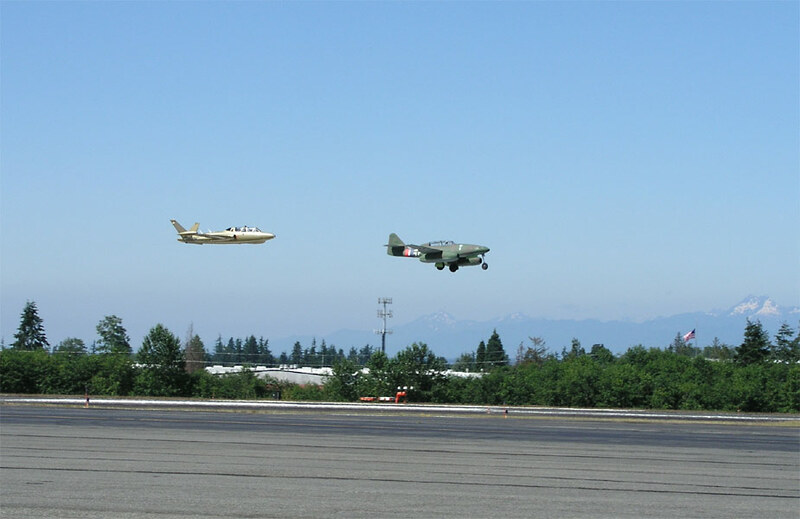 We are especially pleased to report that today's sortie marked our first successful "wheels up" flight in the White 1 airplane (see photo, above). To our relief and delight, the gear cycled flawlessly while aloft, validating the painstaking redesign and rebuild effort that had been underway since the January 2002 landing mishap. Touchdown and rollout were once again picture perfect. 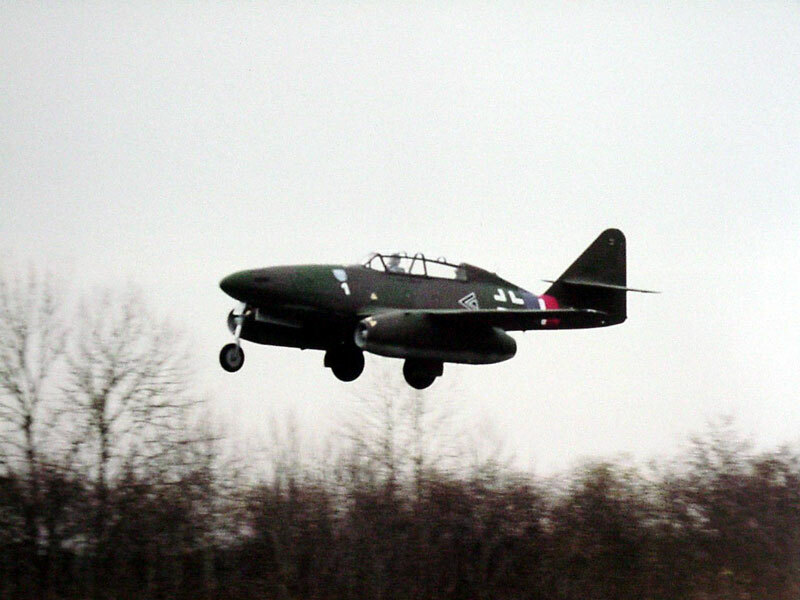 The aircraft also made two 90° turns at the end of the landing roll with no problems whatsoever. Today's flight was once again 50 minutes in duration. We can safely call this one a true milestone for the Project as we draw ever closer to completion of the FAA flight test requirement. GOOD NEWS! On the 25th, White 1 logged another 50 minutes aloft on test flight number seven. The flight was conducted "gear down" once again. By all accounts, things went precisely according to plan, with no unpleasant surprises or other problems. We are now more than 51% through the FAA mandated 10 hour flight test requirement. Additional test flights will be scheduled at end of this month and/or early next month to reach the crucial 10 hour mark. 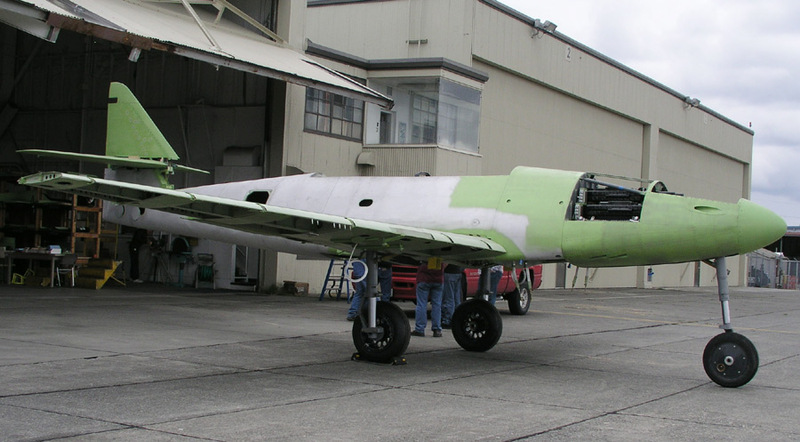 Progress on Tango-Tango continues and has now undergone two successful ground runs of the installed CJ-610 engines. 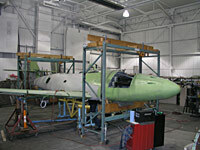 White 1 is in final preparation for additional test flights (weather dependent) later in December or early January 2005. Tango-Tango has the CJ-610 engines installed and the first engine test was conducted successfully (see photo, above). Additional engine runs are planned for later this month, before we start ground tests and taxi runs. 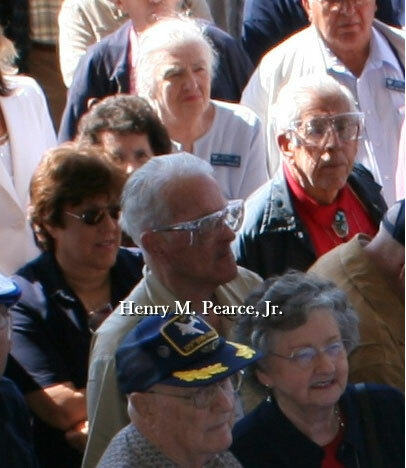 IN MEMORIAM We regret to announce that one of our volunteers, Mr. William "Bill" Pierce suffered a heart attack on October 4, 2004 and did not recover. 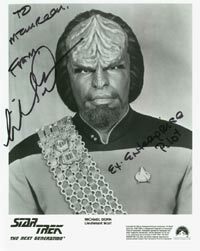 Bill had been a member of the team for the past year or so, and he will be greatly missed. Our thoughts and prayers go out to Bill's family and friends during this difficult time. TEST FLIGHT DATA Our fifth and sixth test flights for White 1 took place as scheduled during the month of September. Each flight was approximately 50 minutes in length. While various minor adjustments and flight squawks were noted along the way, both flights were successful. 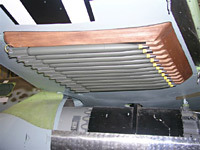 Minor structural adjustments were made to a forward slat to eliminate binding, with other tweaks taking place as necessary. We are currently at the halfway point (or very nearly so) for the 10 hour FAA flight requirement, and additional flights are planned for later in the month. Tango-Tango is currently in final assembly with both engines now fully wired and installed. Initial engine runs are also planned for later in the month. 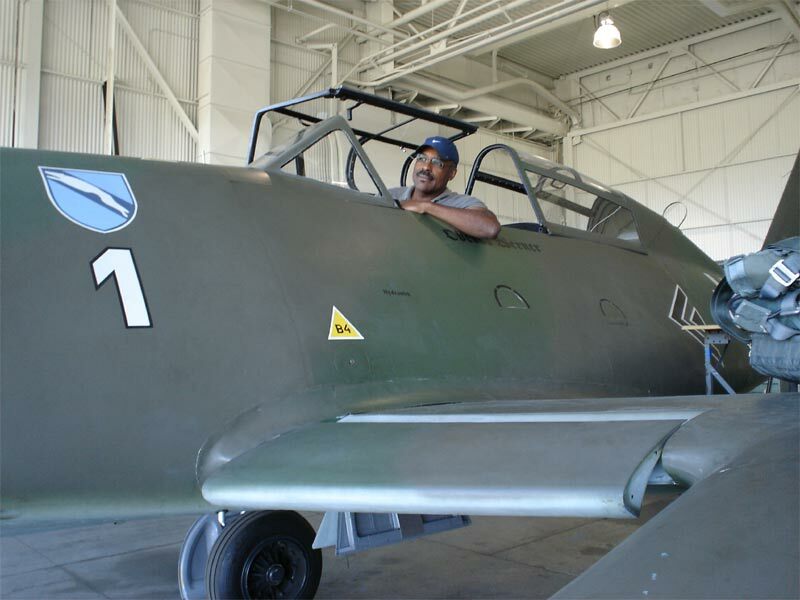 SPECIAL VISITOR One of the the original team pilots for "Watson's Whizzers" (see their story elsewhere on the Stormbirds site) Mr. Roy W. Brown recently visited the Me 262 Project. Roy was on his way to a cruise to Alaska with his family and came by to see our progress. Roy hopped into the cockpit of our single-seater and, not surprisingly, seemed right at home. 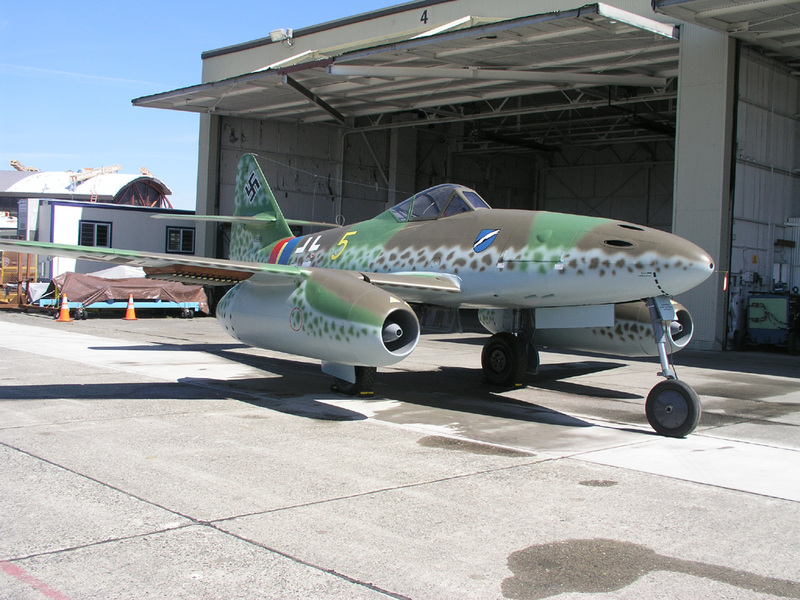 As mentioned above, Roy flew a captured Me 262 out of Lechfeld, Germany in June of 1945 for eventual testing and evaluation in the states. 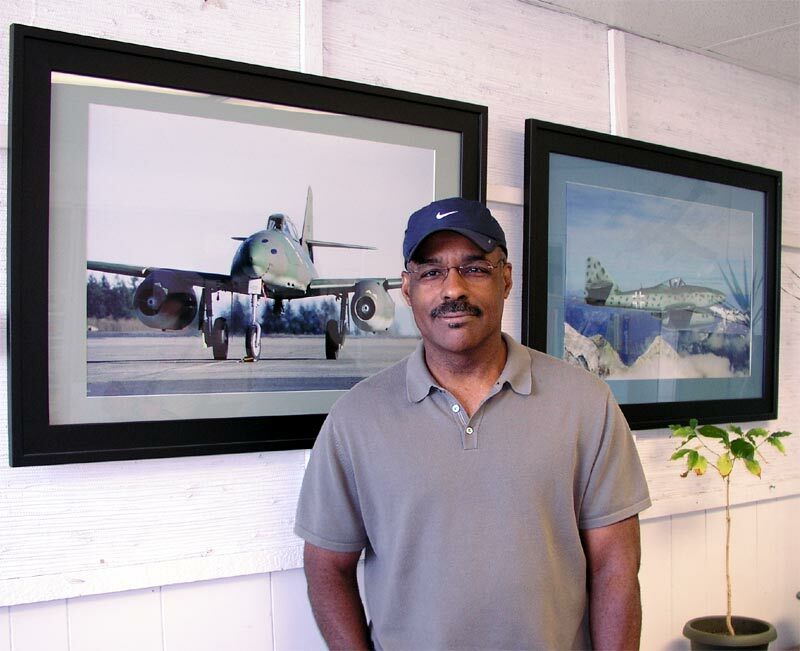 After leaving the Army Air Forces, Brown became a successful businessman in central Ohio, where he and his family settled, and still live today. 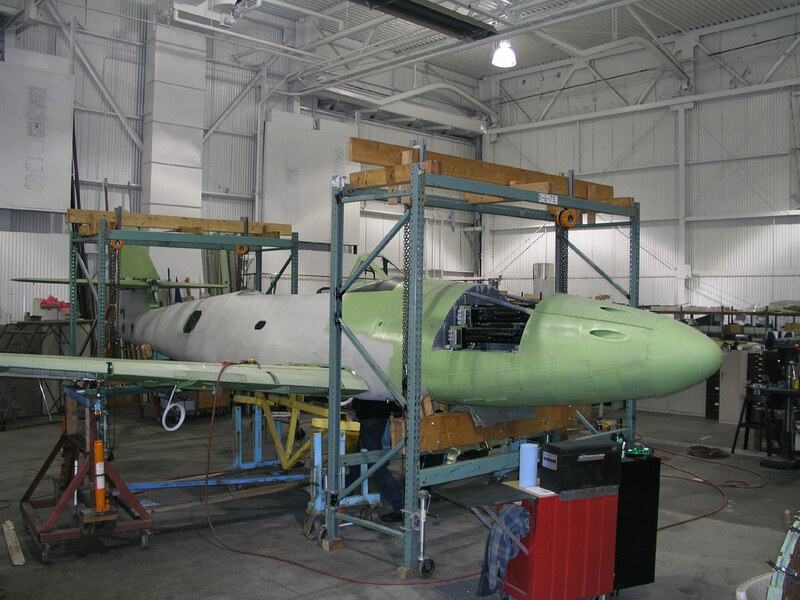 PROGRESS UPDATES White 1 is being prepared for test flight number six by the end of August 2004. Minor repairs and flight squawks being worked off prior to next flight. Meanwhile, Tango-Tango (again, formerly our "Red Nose" aircraft) is undergoing jet engine installations -- complete with all of the requisite wiring and connections. 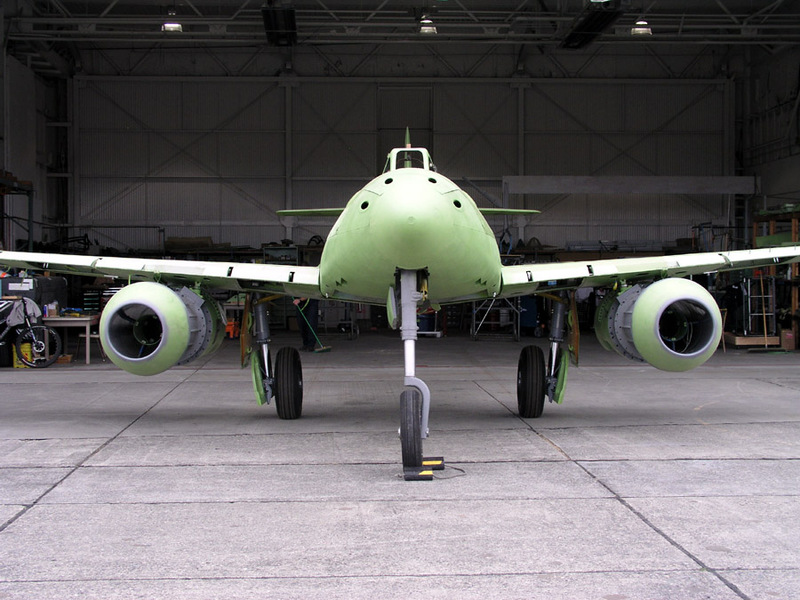 The next major event for this aircraft will be engine testing. NEWS FLASH The Legend Flies Again! We are pleased to report that White 1 completed its third test flight on June 29th. The flight was a resounding success, and and everything went as planned. 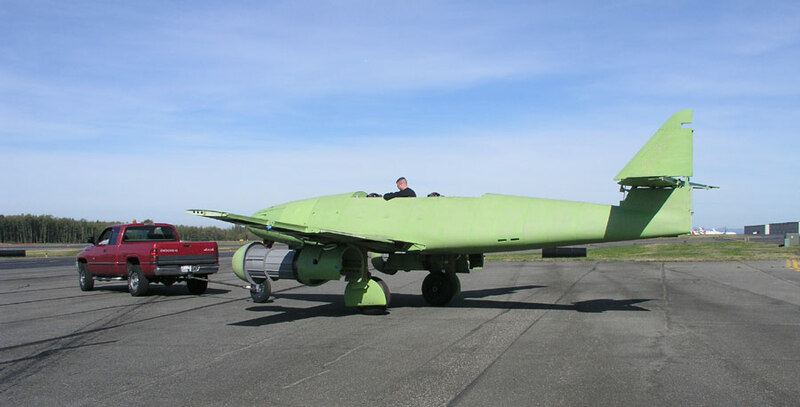 As the photo below illustrates, the wheels were left down for this flight (the chase plane is a Fouga Magister 2 seat trainer). 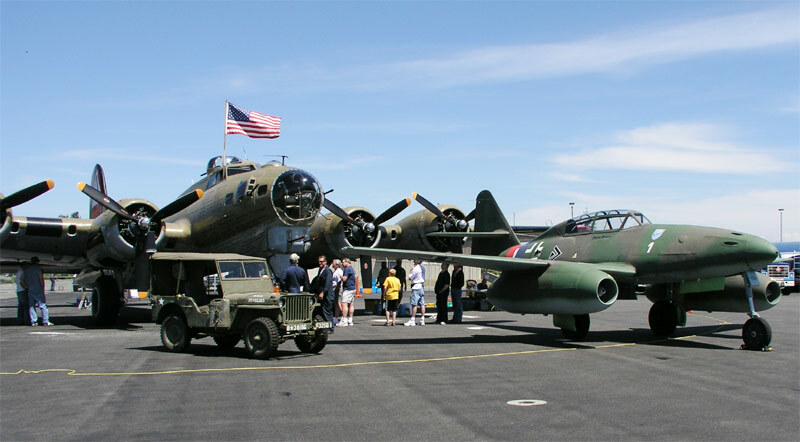 Afterwards, White 1 was parked next to the Collings Foundation B-17 for some rather nostalgic and significant photos. PROJECT UPDATE Preflight activities for White 1 have restarted, and two short taxi-tests were successfully run first week of June. 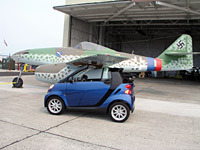 Full length high speed taxi-tests are planned for later this month. Meanwhile, Tango-Tango has been undergoing final assembly wiring of the cockpit, while additional electrical components (long lead items) are being ordered. 1. White 1 continues to undergo final de-bugging prior to resuming preflight activities. a. 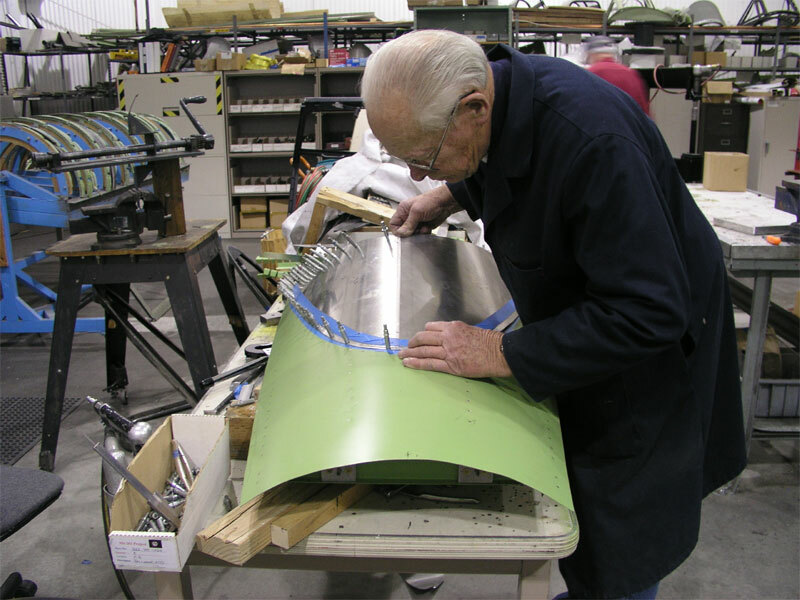 Build and assemble front, aft and side cowlings. b. Control surfaces (forward and aft) are in the build process. 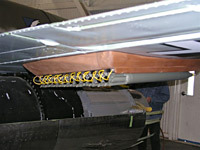 c. Newly-machined landing gear actuators being installed. d. Landing Gear doors being built and installed. More information will be made available once preflight activities begin. FLYING MODEL DONATED This 1/8 scale flying model was made by David Plummer beginning Feb. 5, 1998 and completed July 17, 1998. 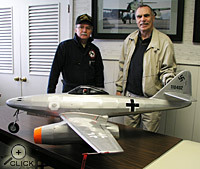 David donated this model to the Me 262 Project on March 18, 2004. We appreciate the donation as well as the effort it took to make and have the model hanging here at the facility. with Nick Cirelli of our project. 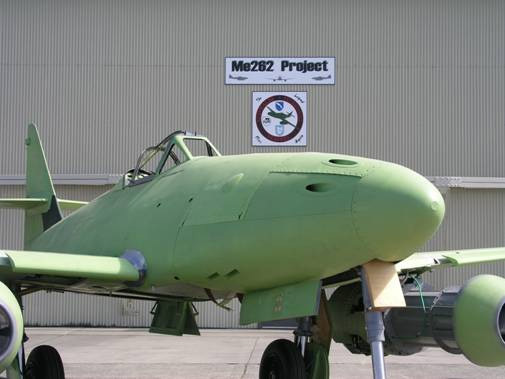 MEDIA COVERAGE UPDATE The SEATTLE TIMES has recently published an article on the Me 262 Project. You can read it online here. 1. Newly built actuator testing is complete (and installations underway) on White 1. 2. Fuel tanks are now being reinstalled in White 1. 3. Newly-built landing gear doors are now in final fabrication. 4. 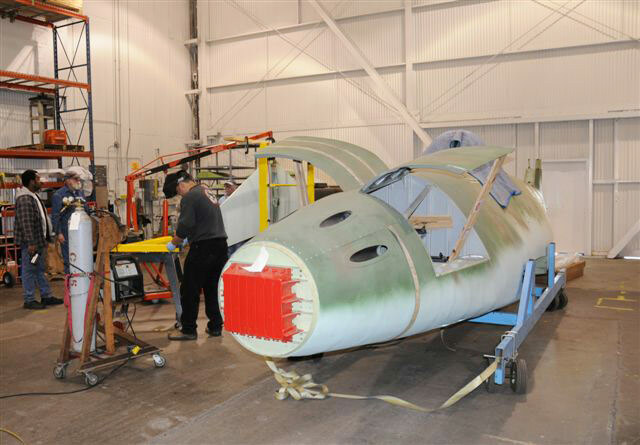 Wing-to-fuselage mating is complete on "Tango-Tango" (formerly called Red Nose). 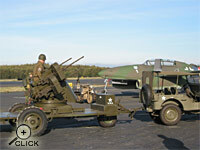 NEW PHOTOS The Military Vehicles club joined us for a photo shoot with a locally owned KETTENKRAD (tow vehicle). 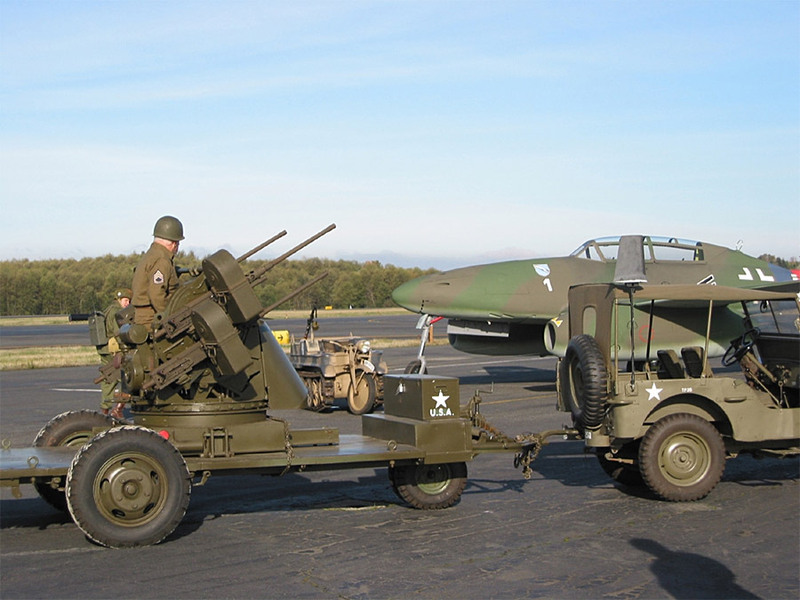 We rolled out White 1 and took pictures of this rare military vehicle that is still in running condition. 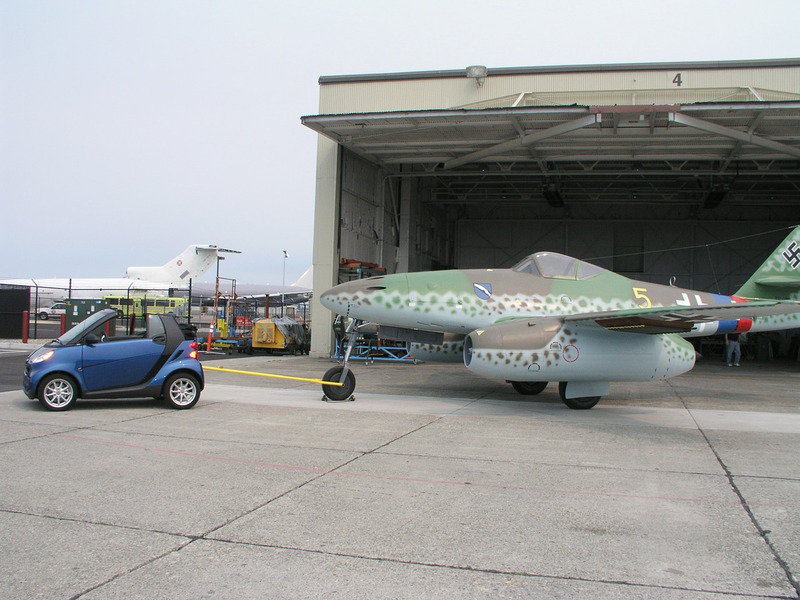 As far as we know this is the first time since 1945 that an Me 262 has been towed by a KETTENKRAD and photographed. Below are a few more shots from the event. PROGRESS REPORT White 1 has now been repainted and has been returned to our hangar. 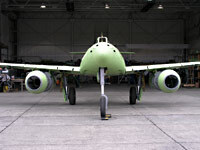 prior to next test flight. 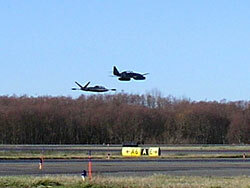 Flight Tests # 3 and #4 are in preplanning activities. PROGRESS REPORT White 1 is scheduled to get a new paint job later this month. Additional test flights are currently in the planning stage, with actual flights later this fall. 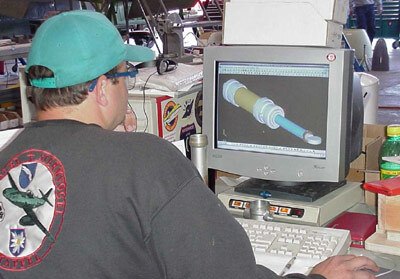 New actuator main landing gear parts are being completed and shipped from our subcontractor. 1. The aircraft has been 90% structurally repaired. 2. Engines have been re-tested on test rig. 3. Build of new actuators underway. We will have more data to post at the end of this month. 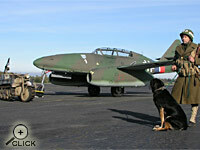 SPECIAL VISIT The Me 262 Project received a special visit from the Victoria Flying Club. 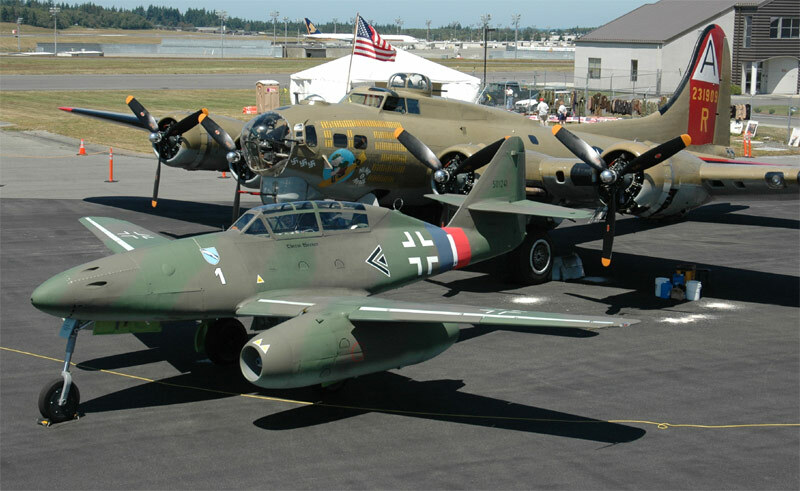 Nine airplanes carrying twenty people arrived at Paine Field to visit the Me 262 Project and tour the facilities. The event occurred on Canada Day (July 1st). 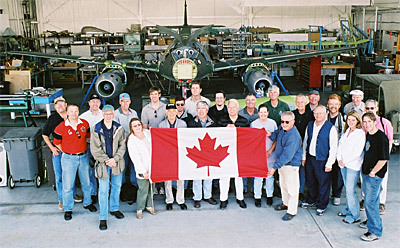 The group had the trip planned for over a year. They are all really big Me 262 fans and everyone had a great time. REPAIR UPDATE In response to our last update, we have original actuators from collectors in Germany and are making copies. 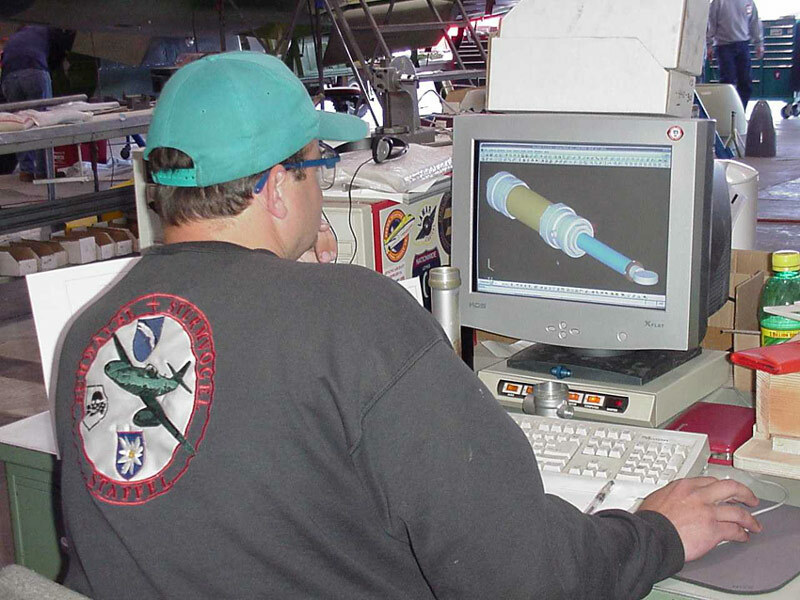 We are using CAD software to create "new drawings" to build all new actuators for the revised landing gear system (see above photo). At this point, the structural repair of White 1 is 90% complete. The work is proceeding as expected on the estimated schedule of 5-6 months to repair damage. PARTS UPDATE In order to complete our repairs we are in a desperate search for a specific Nose Landing Gear Drawing # 19-2437-400E, dated 1942 or 1943. Note! see above update. We know the company that made these actuators was called "Elma" which was located in Stuttgart during WWII. They are still around but are now called "Behr" and have let us know they have no records prior to 1945! The Messerschmitt Foundation and others have also been contacted for assistance, however the needed information has not been located in any archives. REPAIR UPDATE Progress continues on the repairs being made to White 1 after the unfortunate landing gear collapse incident. 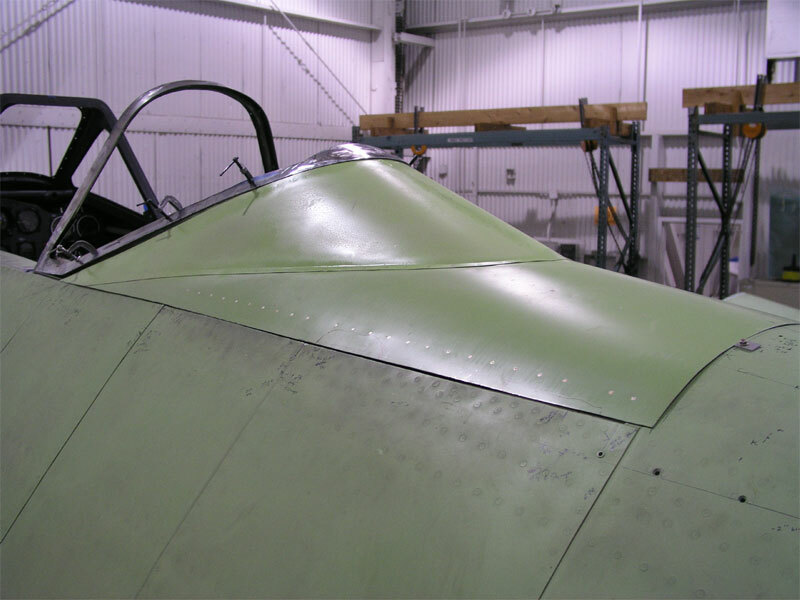 As many of our regular visitors may be aware, the wing had to be removed from the airplane in order to accomplish the repairs. 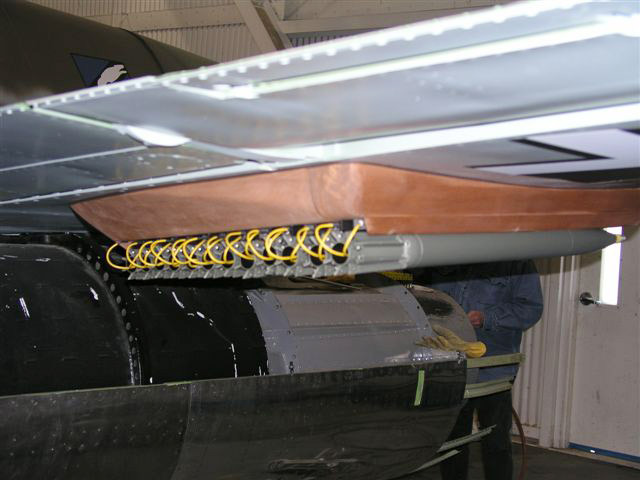 Recently the 100% repaired wing was again mated to the 100% repaired fuselage. Also note "Red Nose" on the ramp as well. 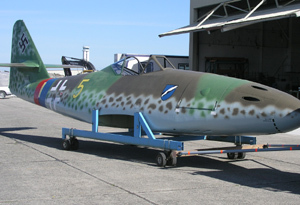 PROGRESS REPORT As promised, we will now begin to provide regular updates on the progress of our second jet, "Red Nose," destined for the Messerschmitt Foundation in Germany. On the 14th of February, a significant milestone was reached as the wing and fuselage were mated for the first time. AVIATION WEEK has now posted the anticipated video footage of our first flight on 20 December to their AviationNow web site. You can view the segment, entitled Me 262 Reborn, HERE. REPAIRS UNDERWAY We are now proceeding to repair the airplane using existing parts from our inventory. While we will be keeping specific details to a minimum in order to concentrate our efforts upon the work at hand, we have made significant progress in our investigations, and expect to have White 1 ready to resume flight testing within 90 days. 6. Determine priorities for future work. WHITE 1 FOLLOW UP We expect to rehangar the aircraft later today, and begin a detailed inspection to see precisely what repairs and retrofits may be warranted before resuming the flight test program. In the meantime, The Everett Herald provided some basic coverage of Friday's events HERE. LANDING INCIDENT As many of our regular visitors may be aware, our second test flight on Friday was complicated by the collapse of the left main landing gear. Test pilot Wolf Czaia was uninjured during this sequence, and we are currently assessing what repairs may be required to resume testing. The exact cause was unclear at the time of this update. 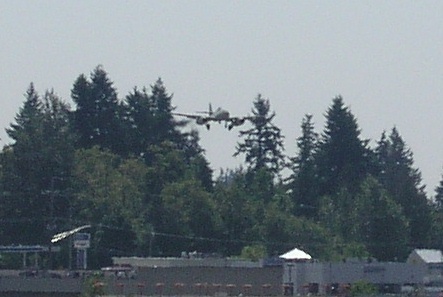 Video footage of the landing may be found HERE. While we obviously must view this as a temporary setback, such events are not uncommon in the early phases of any test flight program, and this is precisely why we undertake test flight programs to begin with. The project continues!! MORE MEDIA COVERAGE The Cable News Network has been with us all week, and plans to release a story on the project to both US and European markets (including NTV, ART, ZDF and RTL) on or about 1300 Eastern Standard Time (US) on the 22nd of this month. We expect this will contain some excellent aerial coverage of our second flight, taken with the network's own onboard camera. VIDEO FOOTAGE ONLINE We have provided video footage from the first flight to Aviation Week, and have been told to expect excerpts to appear on their web site during the week of 20 January. 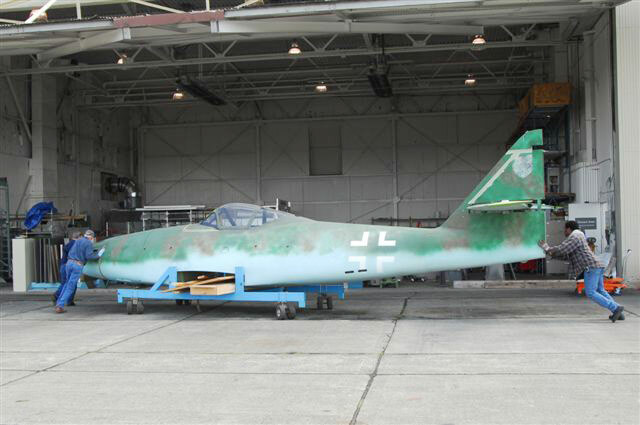 RED NOSE NEWS As expected, inquiries have begun pouring in concerning the of our second aircraft, destined for Germany's Messerschmitt Foundation. While we have set no timetables, per se, current estimates put this aircraft approximately 12 months away from completion. Obviously, we will be updating this situation over the course of the coming year. FIRST FLIGHT COVERAGE As expected, media coverage of the first flight has been considerable, with news feeds from the Associated Press, Aviation Week & Space Technology, and a number of local news organizations (see below). 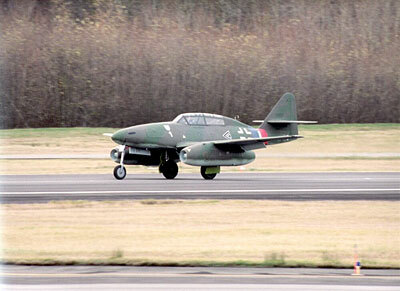 The first of two reproduction Me262A jet fighters flew for 35 minute on December 20 from Paine field near Seattle. 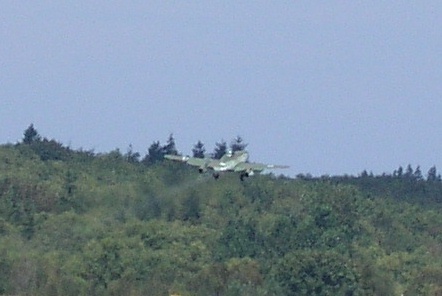 The pilot, Wolfgang Czaia, said the airplane was airborne after a takeoff run of 14 seconds, lifting off at 110 knots. Czaia left the gear down during the flight as a safety precaution. 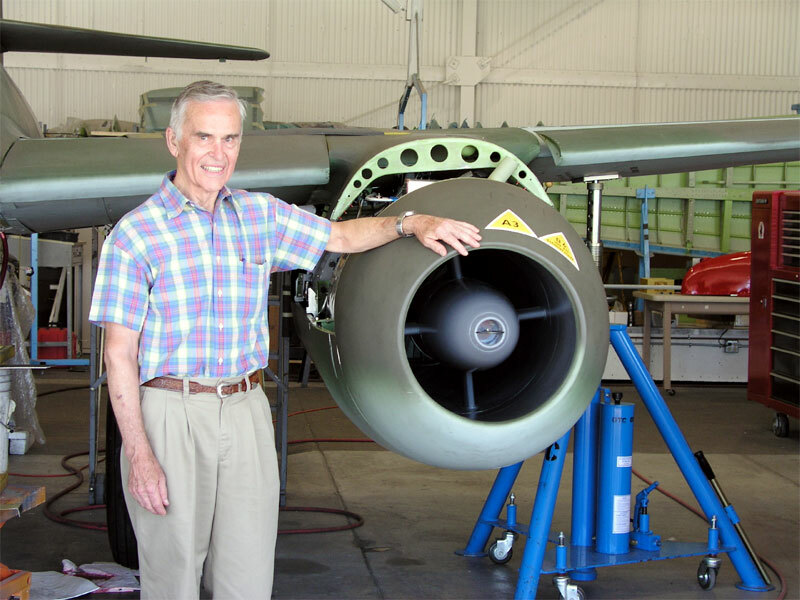 “The airplane’s handling qualities were excellent in all three axes, and I could trim the aircraft to fly straight and level hands-off,” he said. 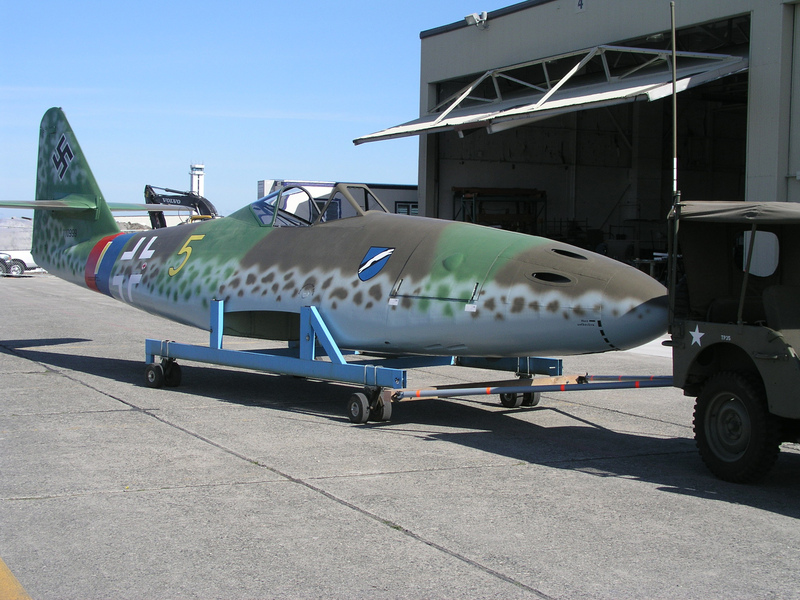 "The Messerschmitt's aerodynamically-operated inboard/outboard leading edge slats worked well, fully extending at 150 knots, and retracting fully at 165 knots, and there was minimum pitch change during flap extension/retraction" Czaia said. Before returning to Paine Field, Czaia set up a 3-degree glide path at 140 knots to check handling on final approach, slowly reducing airspeed and increasing angle of attach until the airplane stalled at 100 knots. “There was only a mild pitch-down at the stall break and I had good aileron control at the stall,” he said. For landing, Czaia flew the final approach with the airplane trimmed for 125 knots, slowly reducing power to touchdown at 108 knots. Czaia said the second flight is tentatively scheduled for late this week and will include retracting the landing gear. 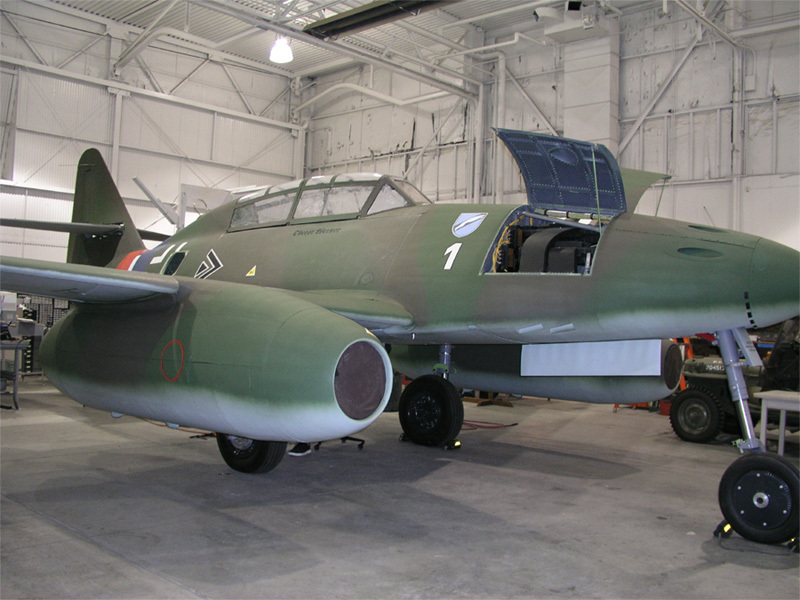 Future flights will expand the airplane’s flight envelope slowly and focus on determining the Me262’s critical Mach number, which is estimated to be Mach .082. 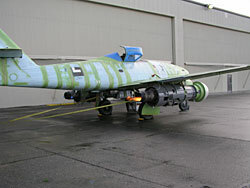 The jet is powered by two GE J-85 turbojet engines each rated at 2,859 lb. static thrust. We are delighted to announce that White 1 took off this afternoon at 1400 local on a 35 minute test flight with pilot Wolf Czaia at the controls. The flight was conducted "wheels down" at 2000 feet with a L-39 chase plane in trail. By all accounts, the flight was a complete success. 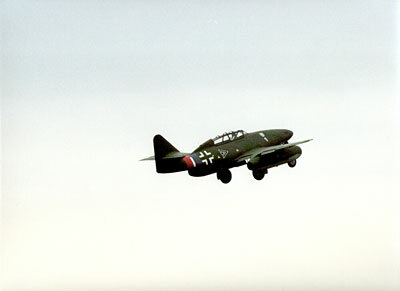 Czaia rated the jet's handling qualities as "excellent." 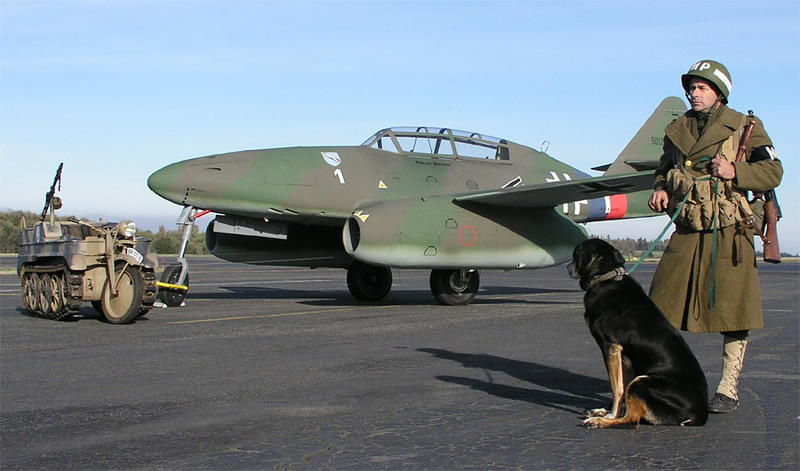 A crowd of some 50 people had gathered to witness the event, and as such, were treated to the first sighting of a Me 262 aloft in more than five decades. © 2003-2006 Sabre Design Group . All rights reserved.